Over a hundred people from a wide range of organisations, from the arts and the NHS to schools, solicitors, churches and charities, gathered in Plymouth last week to discuss ways of collaborating to make the city more compassionate for those at the end of life, or living with bereavement and loss. As a growing city (a predicted 300,000 residents by 2032) with a rising number of over-65s, there are increasing demands on health and social care resources as care becomes more complex and end of life needs grow. New ways of delivering services are needed, and Plymouth has already started to make strides in developing a more inclusive approach to end of life care, with the conference being a call to do more. 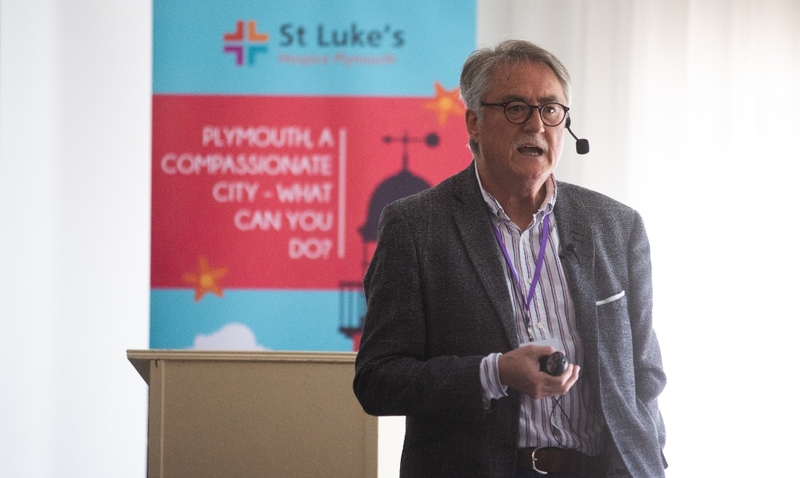 The Compassionate City conference on Thursday 17 May was facilitated by St Luke’s Hospice Plymouth as part of Dying Matters Awareness Week to highlight the positive work currently happening across the city while encouraging co-operation to address existing and future challenges. According to the Compassionate City charter to which Plymouth has committed, ‘a compassionate city is a community that recognises that the natural cycles of health and sickness, birth and death, love and loss occur every day across our society. It defines a compassionate city as one that recognises that care for one another at times of crisis and loss are not solely a task for health and social services but everyone’s responsibility’. Key speaker at the conference, 50th Anniversary (End of Life Care) Professor Allan Kellehear from the University of Bradford, said: “Every day people die and hearts are broken. While we can’t prevent death, by working collectively we can help prevent the harms that can accompany it, such as depression and job loss. Fellow speaker Carole Burgoyne, Strategic Director for People at Plymouth City Council, said: “The Compassionate City Charter for end of life care gives us all a framework to work towards and as a Council we fully support this approach and want to work with our community to make this aspiration a reality. Those at the conference heard inspirational case studies demonstrating a compassionate and joined-up approach to end of life care, including the work of St Luke’s and its partners at Dartmoor Prison and George House Homeless Hostel in Plymouth. There was a call by Gail Wilson, Deputy Clinical Director at St Luke’s, for people to sign up to become Compassionate Friends and make personal pledges to support those at end of life or suffering from bereavement or loss. She called for communities to form compassionate networks in their areas so that no-one feels isolated or alone. Such networks can receive free training through the St Luke’s Compassionate Communities development programme, which aims to form new ways of working between communities and services to improve end of life care locally. Delegates also learned about the Advance Care Plan (ACP) card that can be kept in wallets and purses. Pioneered by St Luke’s, the card highlights to all that there is a personal plan which states the future wishes of the individual. This will help staff ensure the wishes of the person, as far as possible, are respected and acted upon should they be unable to speak up for themselves in their last days. In addition, round table discussions focused on action plans to develop a compassionate city with collective actions for schools and colleges, care homes, places of worship, and city cafes and other social spaces. Speaking about the conference, Abenaa Gyamfuah-Assibey, St Luke’s Community Development Worker, said: “It was really encouraging to see so many organisations and groups represented and engaging enthusiastically in the thought-provoking discussions at this event. “The day was a huge success in developing a communal vision of Plymouth as a Compassionate City and putting ideas into action to ensure positive outcomes that will support everyone at times of difficulty and loss, regardless of their age, culture or background. Find out how you can become a compassionate community.